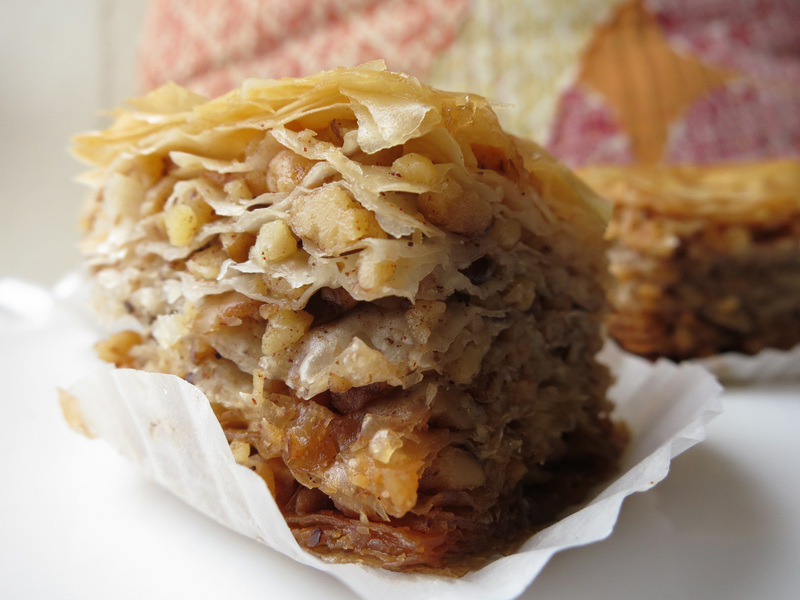 Some baklava recipes call for shortcuts: a single thick layer of walnuts, fewer phyllo layers, fewer steps. Like some masterpiece of culinary geology, its sedimentary layers of crispy phyllo dough enclose many thin levels of toasted walnuts. These layers take much time to set down, little time to eat, and the reminiscing can go on as long as you'd like. Read on for the real deal. This awesome structure is not without flavor. Your senses are up against toasted walnuts, phyllo, and butter that have been browned to perfection (thanks to the Maillard reaction), and spiced with some cinnamon heat. To top it off, the whole slab is drenched in a cool honey and lemon-zest syrup straight out of the oven in one dramatic sizzling moment. 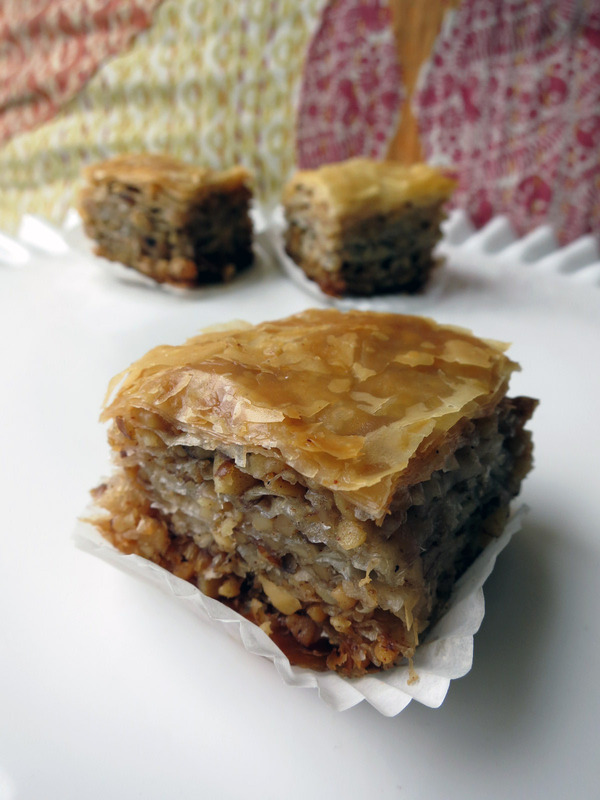 Faster time-to-consumption baklava recipes exist, but do tastier ones? I can't say. This one hooked me five years ago, and I haven't yet looked further. It has become one of my signature desserts. The original recipe is at allrecipes.com, but I've modified it based on suggestions in the reviews and my own experiences. I provide my version below. This recipe is definitely not the only way to get a delicious slice of baklava, and is not characteristic of all baklava. The dessert is common to many cuisines including those of Central and Southwest Asia, the former Ottoman Empire and its successors in Anatolia, the Balkans, and much of the Middle East and North Africa. Regional variations abound. I am not expert on any of those variations (though that could become an exciting new hobby). I do know that as you sample across cuisines, you'll see baklava made with a variety of nuts (pistachios, almonds, walnuts or other nuts) ground to different consistencies, a variety of flavorings (rosewater, vanilla, orange blossom water), spices that can include cinnamon, cloves and cardamom, and different ratios of dough, filling and syrup. Roast walnuts: Chop walnuts and roast on a pan for about 5 min or until aromatic/lightly browned. Check often. Stir once to redistribute to aid in even browning. Allow roasted walnuts to cool briefly, then toss in a bowl with cinnamon and optional clove/nutmeg. Set aside. Make sauce: Boil sugar and water until sugar is melted. Add vanilla OR rosewater. Add the honey (Tip for measuring honey: lightly oil the measuring cup first to prevent honey from sticking when you pour it out.) Add lemon zest. Simmer for about 20 minutes. Put in refrigerator or freezer...you want it to be lukewarm or cool by the time the baklava comes out of the oven. Preheat oven to 350 F (175 C). Butter the bottom and sides of a 9"x13" pan. Melt 1 cup of butter in a container. Set container of melted butter and pastry brush near your baklava workstation. Unroll thawed phyllo dough. Some brands of phyllo are twice the size of the pan, so if needed, cut sheets in half to fit pan. Cover unrolled phyllo with a slightly damp paper towel or keep it covered in saran wrap to prevent it from drying out as you work. Be careful: a too-wet towel will soak into the phyllo sheets and make them soggy and impossible to separate. Place two sheets of dough in pan, butter thoroughly with melted butter and a pastry brush. Repeat, using two sheets of dough at a time, until you have 8 sheets layered to form the base of the dessert. Sprinkle 2 - 3 tablespoons of nut mixture on top. It won't look like a lot of nuts, but it adds up in the end. Top with two more sheets of dough, brush with butter, and add 2-3 more tablespoons of nuts, layering as you go. Continue until there are 6 to 8 sheets of phyllo left. Layer these two at a time brushed with butter on the top of the baklava to form the top of the dessert. While the dessert is still unbaked, use a sharp knife to cut the baklava into diamond or square shapes. Be sure you slice through all the layers. Bake in 350 F oven (175 C) for about 50 minutes or until baklava is golden and crisp. Remove baklava from oven and immediately pour the sauce over it. I've heard that pouring the cold sauce over the hot baklava is key to a crispy baklava, but I can't confirm or deny it; I've never tried making it any other way. Those look amazing! I've always wanted to try making baklava but am a little intimidated.